It’s time for a quick winter health update. Once again we are sharing these tips with Community contacts to ask for your help in keeping our neighbourhoods, friends and relatives healthy this winter. It’s important to get this vital information to as many people in Hull as possible. Please can you share the information below with anyone who may benefit within your community. Would you know where to go if you or someone you love required medical care over the Christmas bank holiday? Pharmacies are a great port of call to help you tackle many common ailments. From coughs and indigestion to rashes; your pharmacist will be able to advise. 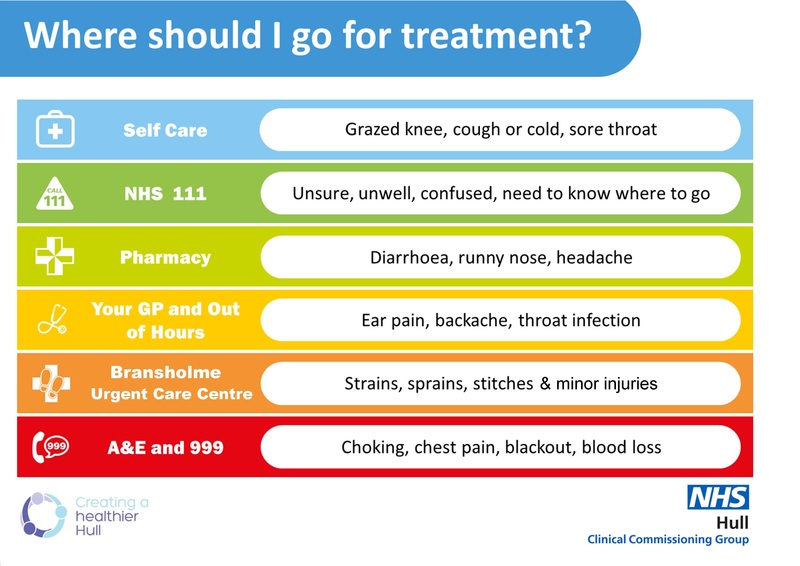 If you’ve had a mishap the Bransholme Urgent Care Centre (UCC) provides 24 hour care, every day of the year, for minor injuries such as minor fractures, sprains, strains, cuts, bites and mild burns. People in need of immediate treatment, who are not in a life-threatening situation, can be seen quickly and effectively at the centre. If you need medical treatment, but it’s not an emergency, please book an appointment with your regular GP. Check your GP’s website for Christmas opening hours. If you need to see a GP with something that can’t wait till the next day there is a Walk-In Service at Story Street Medical Centre. Over the Christmas break the service will run from 8am-8pm every day, including Christmas Day. For people who are still unsure where to go then they should ‘Talk before you walk’ and call NHS 111, a free to call 24/7 service that offers expert guidance and can advise where to go for medical help. Finally, please remember that A&E is for serious stuff.